That's what she sang. Forget upper 'C' or an octave lower than the bottom of your boots. She sang songs in the key Life, with a capital Luh. Not that she sang, as such. She didn't warble one hit wonders from the 80s or rap like Eminem in a skirt - or rather scrubs. I don't think I heard her even so much as hum a happy tune, but she could sing, still. "What you talking about, Willis?" I hear you say. Well, of course I don't hear you say that at all. Partly because, I would assume, many of you don't even know who Willis is and partly because you're there, wherever 'there' might be, and I'm here, snuggled up cosier than a bug in a rug in front of a roaring fire. With the central heating on. And a thermal vest - though I doubt they make thermals that small or with that many leg/arm holes. You never know, though. You can get anything on Ebay these days. Songs. Life. The key of. Of what do I speak. Have you ever heard someone pluck at a harp string, perfectly tuned and perfectly plucked? No? 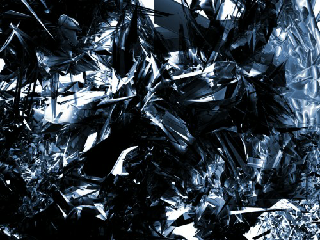 How about crystal shattering on a stone floor. Probably on a summer's day when the air is fresh and silent. All you hear is the noise of the smash, but it's almost a flawless sound. As sharp and as clear as the crystal itself. No? Well, imagine it then. Think of what those sounds would be like. They'd pierce your eardrum with an absolute clarity and ring through your brain. Zoe was like that. They say someone can be a breath of fresh air. She was. In the enclosed space of the recreation room - and, to be honest, the rest of the asylum as 'Outside' was almost forbidden territory - the air always felt recycled. It felt used and second hand. Like it had been picked up for 50p at a car boot sale early one Sunday morning. But when she swept by (she did sweep -it was never simply a walk), the wake of her passing was like the harp string being plucked, possibly with a crystal shard as the plectrum. You found yourself breathing in, a breath so deep it filled your lungs and kept on going, storing reserves of freshness from your treacle-toes up. She sang with her body and with her spirit. Always bright. Always a smile -not necessarily dazzling, but there nonetheless. Her eyes held a twinkle in them that, I don't doubt, was there voluntarily rather than being held captive, imprisoned by the iris behind the bars of the lens. Why would such a girl be in here? The death of a baby. The dark place it must plunge you into. The bright cell of denial she locked herself away in. What do you do with that pain? How can you bind it so tightly you are able ignore its presence? Does that make you a master of deception - the deceived being yourself? Does it show the Hulk-like inner strength, but without the green, pants tearing aspect? Or does it make you crazy? Zoe sings a song of Life inspired by the absence of the same. A song of Life composed after a visit from Death. I didn't realise the Reaper was such an artist. Maybe I should sing along. This is very well written. I like the imagery and use of description! “Indies Unlimited sent me. It is like the blogFest, so here I am and now that I found your blog I will be sharing, thank you.